A machine that is suitable for cutting shapes out of rolls of soft material, such as fabric, rubber, cork, cardboard, or leather, using a metal tool called a die. 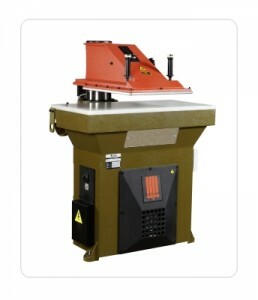 Click presses are widely used in the manufacture shoes, wallets, gaskets and saddler. This is because the head swings away to allow full view of materials and easy access to move and reposition dies, also allows tools of varying heights to be used without major adjustments. Using a clicker press to cut materials is very simple process, called die cutting. You have a die in the desired shape you want to cut, you place the material you want to cut on a cutting surface, normally this will be a polypropylene cutting board, then you place the die on top of the material and then lower the head down on top of the die, via two safety switches, pressed simultaneously, This will force about 10 to 25 tons of pressure depending on the type of machine you have, on the die to cut through the material, once the head reaches the has retracted you will have the desired shape. A clicker press is very useful as it can be used to cut through several layers of material at the same time, (this will depend on the die used). When using a clicker press a cutting board must be used with a cutting dye this is usually made from a soft cutting surface, commonly used is polypropylene. using a proper cutting board will prolong the cutting die usage, using an in proper cutting board will reduce the tool life, a replacement tool or re-sharpening will be required often.